This practice based research dissertation presents a new approach to improvisation in animation using digital sculpture. 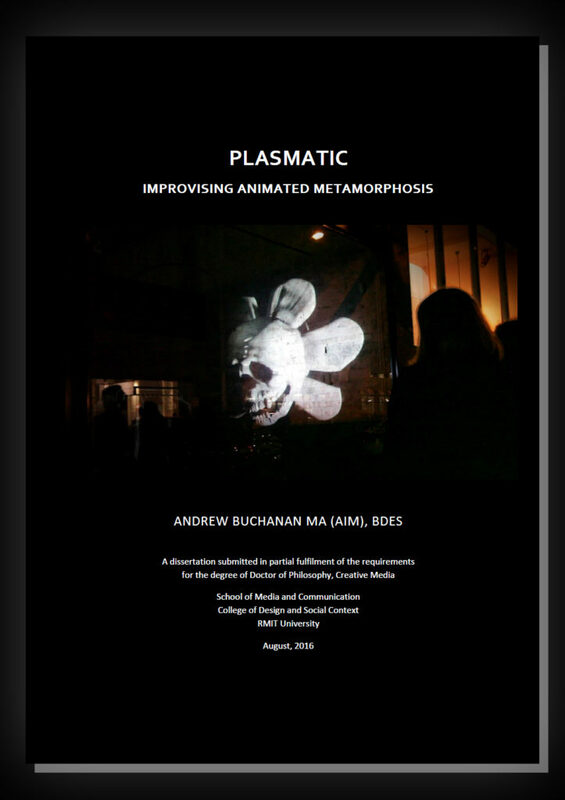 The artworks submitted are supported in this document by both a comprehensive description of the processes and practice approaches used in their creation, as well as a theoretical grounding that links improvisation, digital sculpture, and animated metamorphosis through psychology, practice, cognitive science and philosophy. Including both software tools and virtual materials in an embodied model of cognition, this research describes a new workflow based on an improvisational material interaction with virtual 3D mesh through digital sculpting software.The natural product of this iterative, improvisational process is metamorphic animation, able to convey the substantive and transitive aspects of cognition in animated form. This dissertation supports a series of works titled Plasmatic (No. 1, No. 2 and No. 3) that were produced and exhibited in 2014 and 2015, as well as a range of experiments that show the development of the workflow and unique approach to the creation of the final works. Existing theories of metamorphosis in animation focus on the cultural, political and ontological freedom offered by unconstrained graphical forms. This research expands these theories of metamorphosis by showing that animated metamorphosis can also depict functional correlations between image and thought processes. This approach is not focused on analysis of the contents of thought, or on the contents of the animated morphing images, but rather connects the medium specific aesthetic of the metamorphic image and the processes of its creation with the temporally extended processes of thought progression. Animated metamorphosis allows for a visual depiction of the transformation from one thought to the next. The Plasmatic series submitted supports an argument that metamorphic animation can be used as a heterophenomenological vehicle for conveying the nature of a spontaneous thought impulse and stream of consciousness to an audience. In this way, this practice based research presents the process of animation as an investigation into phenomenal consciousness, and the animated metamorphic image as a unique philosophical instrument. This project resulted substantial research that is currently either unpublished, or only presented in part at academic conferences. Abstracts from these presentations can be found here. A prioritised selection of these will now be prepared for submission for peer review and publication.